Wow, it’s been a little quiet around here lately! 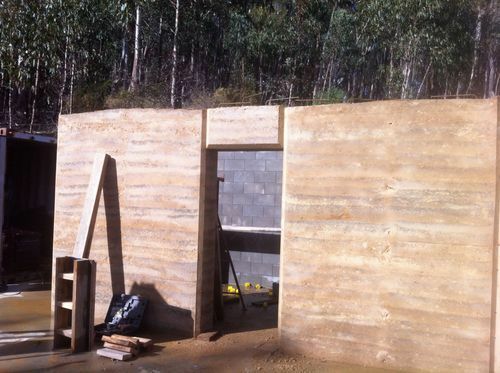 Since completing the rammed earth, I’ve been a little lacking in momentum on the building site. I’ve not made a very good transition from the single-minded purpose that the last month or so of earth ramming has required and so not a lot of progress has been made. My only real concern with them is … drum roll … the weather. Not because I think they’ll suffer being exposed; I’ve used enough Plasticure in the mix that I’m certain they’re weatherproof. Rather, my concern is that the slab around the middle of the wall is a bit low, so water tends to pool there up to a centimetre deep. You can see the effect in the photo above - a little moisture creeps up the first 5cm or so of wall, and it’s staying wet. 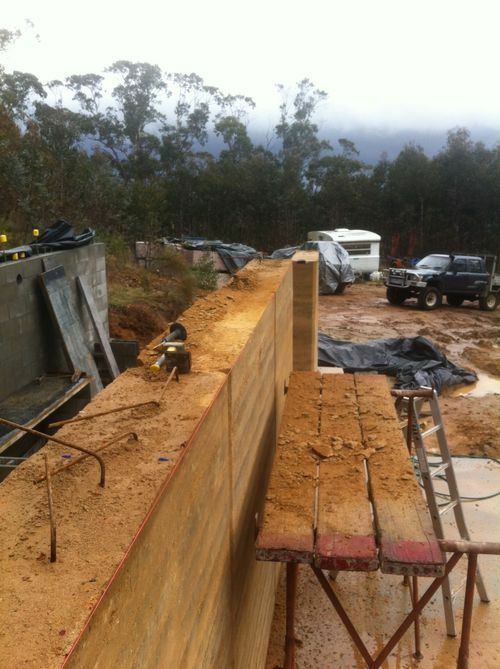 The worry is that the constant moisture will reverse the effect of the cement in the mix, destabilising it. 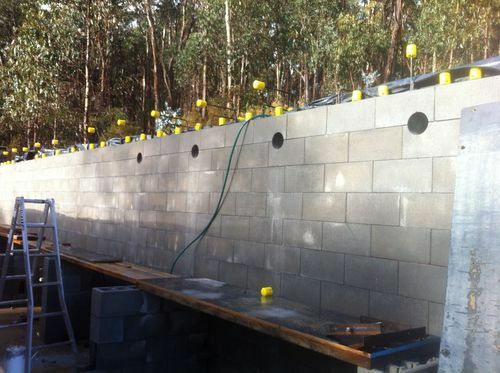 I’ve been wondering how to deal with this and seal the base of the walls against the pooling water, and I think I’ll just go with the obvious approach - silicone. I’ll run a dirty great bead of the stuff all the way around the base, up to about 2cm high which is above the high water mark. With any luck this will keep the majority of the water away from the wall until I can get a roof over them. If I’m heavy-handed enough with it I should be able to remove it later without leaving very much behind, if I’m lucky. The vents for the battery room need to be bored. 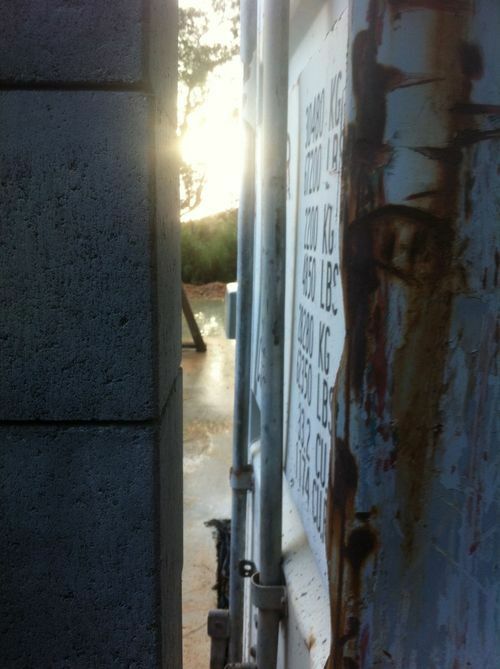 The rear of the shipping container needs to be rust treated before I can seal it with the tanking system. 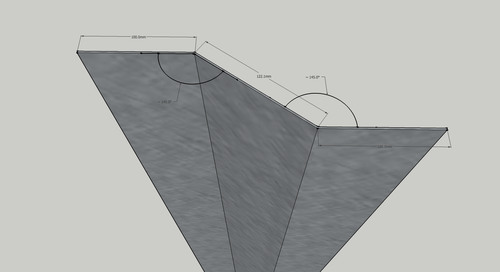 I need to deal with the gap between the retaining wall and the shipping container. Last weekend I took care of job #1. I had originally planned to bore these myself, but the right gear wasn’t available to hire locally so I was referred to a company in Seymour who specialise in cable and trench laying, but who also have the equipment for concrete boring as part of that job. Luckily they had a “down” day on Friday from their usual Docklands job and were available to bore my holes at short notice. $100 per hole! I wasn’t particularly happy with the quote when organising it, but after seeing how much work this was and the equipment involved, I know they’ve earned their money. 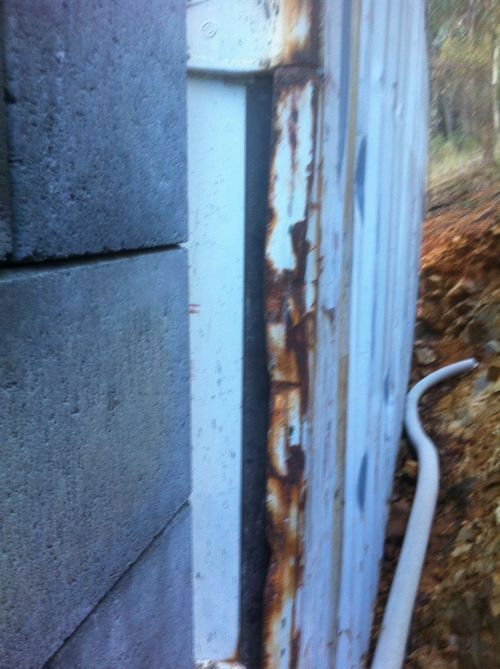 This wall is tuff stuff… it made short work of their diamond-tipped auger! This will be screwed and liquid-nailed to the wall and container, and the tanking sealant will go over the top of the lot. Well, that day has come (and gone), and I spent it with a brick bolster and lump hammer, chipping away at the tops of the walls. 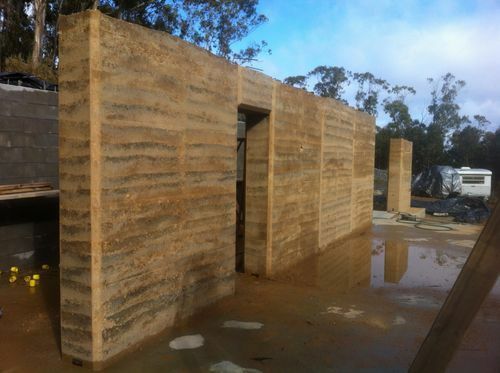 Any doubts I had (and I must admit, I did have them) as to the strength of my rammed earth have been well and truly dispelled - this stuff is hard! It’s taken me the better part of a day to complete one half of the wall, and this is the easy half. The back half of the wall I’ll attack with a dirty-great masonry disc on the angle grinder, since along much of the length I need to cut a 100x50mm rebate in which the polystyrene insulation / forms for the suspended slab will nestle.